Epidermolysis bullosa (EB) is a group of rare diseases that cause skin to blister easily. In severe cases, blisters may even be internal (e.g., in mucosal tissues or organs). More than 300 mutations have been identified in this condition. Most of the many types of EB are inherited, and the condition usually manifests in infants and young children; some patients don’t develop symptoms until adolescence or early adulthood. Exceptionally mild cases may remain undetected. Human skin has an outer layer (epidermis), a middle layer (dermis), and a lower layer (subcutis). Protein anchors prevent shearing between the top two layers. In EB patients, certain proteins are missing, allowing skin layers to separate with even minor mechanical friction. Patients have compared the blister/sore pain to that of third-degree burns. Increased risk of skin cancer is one potential complication. EB simplex is the most common form, typically affecting hands and feet, involving autosomal dominant inheritance of keratin genes. Junctional EB affects laminin and collagen, with autosomal recessive inheritance. Dystrophic EB is an autosomal dominant and recessive collagen variant affecting skin and organs. Epidemiology: About 50 babies in a million are born with EB, which affects some nine of every million people worldwide. Most cases (92%) are simplex, with 5% DEB, 1% JEB, and 2% unclassified. The disorder occurs in every racial and ethnic group and affects both sexes. Infancy is an especially difficult time for EB patients. Generalized blistering can lead to infection, sepsis, and death. Patients with the most lethal forms of EB face an estimated mortality rate of 87% during the first year of life. For those who survive, the most common cause of death is metastatic squamous-cell carcinoma, particularly in patients with recessively inherited EB. The dominantly inherited EB simplex and DEB and milder forms of JEB are less likely to shorten life expectancy. Treatment Options: EB has no cure, but milder forms can improve with age. Treatment generally addresses symptoms (e.g., infection and itching) and prevents pain and new wounds. The Apligraf bilayered bioengineered skin substitute from Organogenesis has shown about a 50% success rate in closing EB wounds. Modern EB research is focusing on related genetics. Gene therapy investigators are studying keratinocytes and trying to prevent genes from expressing faulty keratin. Others have reintroduced modified cells back into mouse models — but how long resulting benefits would last is still in question. Stem cells could present another option. Meanwhile, diagnosticians are helping in vitro fertilization doctors select against the associated gene mutations for prospective parents who carry EB. Fibrocell Science Inc. (Exton, PA) and Scioderm (Durham, NC) are two biotechnology companies working in this area. In May 2015, the FDA granted rare pediatric disease designation to Fibrocell’s lead orphan gene-therapy drug candidate for recessive DEB. And in September 2015, Amicus Therapeutics acquired Scioderm, which has a topical therapy (Zorblisa) for EB blisters and lesions currently in phase 3 trials. Meanwhile, stem-cell transplant therapy trials for recessive DEB are ongoing at the University of Minnesota and the Cincinnati Children’s Hospital. Stanford University’s Genetic Skin Disease Center is also actively involved in EB research. Organizations: The DEB Research Association of America (www.debra.org) is the oldest and largest organization devoted to EB. It promotes National EB Awareness Week every 25–31 October. And its 17th annual benefit event will be on 16 November 2015 at the Solomon R. Guggenheim Museum in New York, NY. “EB is an umbrella for many different subconditions,” says Kim Popovich, EB patient and a community leader in online support groups for over 10 years. “Two patients who have the exact same simplex diagnosis, for example, can present very differently. Quality of life is not exclusively dependent on the severity or specific diagnosis. It is true that the most severely affected patients often face limitations socially, professionally, and financially. But mild and moderately affected patients (and even some that are more severely affected) can have very traditional lives, with spouses/partners, children, careers, and fulfilling social lives. EB patients have an uncanny ability to adapt to their physical restrictions. ”Popovich is a perfect example, herself, I can attest. We have been best friends for over 25 years, and I have always admired her confidence, vitality, and indomitable spirit. This series has endeavored to highlight the personal face of rare diseases as well as the related work that biopharmaceutical companies are doing. There are bright, committed individuals on both sides of the equation, and I am honored to take this monthly opportunity to help bring them together. Wataru Kobayahsi (Astellas Pharma) trained in both upstream and downstream processing at BETC in June 2015. Enrollment in training through the Biomanufacturing Education and Training Center (BETC) at Worcester Polytechnic Institute (WPI) more than doubled in the fiscal year that ended in June 2015. A total of 349 people participated in BETC programs in FY 2015, up from 142 the previous year and nearly 10 times the number enrolled in its first year. Employees from 31 companies — including AbbVie, AdvantaPure, Astellas Pharma, AstraZeneca, Biogen, Boehringer Ingelheim, Eppendorf, Genzyme, ImmunoGen, Lonza, Novartis, Pfizer, and Shire — completed BETC programs in FY 2015. The center’s curriculum also expanded in FY 2015, adding openenrollment programs in upstream and downstream biomanufacturing processes, a WPI graduate course in animal cell culture technology, and several customized programs designed for specific biomanufacturing companies and equipment suppliers. “The BETC is maturing into the vital resource that WPI and its partners in industry and state government envisioned,” said Kamal Rashid, BETC director and a research professor at WPI. The center opened in the summer of 2013 and combines classroom instruction with hands-on training in a functional pilot-scale biomanufacturing suite. Before then, WPI’s “Fundamentals of Biomanufacturing” program was held in a smaller facility that now provides contract research and process development services for biotech companies. Success of the fundamentals program prompted WPI (in partnership with the Massachusetts Life Sciences Center) to build a state-ofthe-art training facility fully equipped with industrystandard laboratories and support systems. It still offers a fundamentals program, which had 61 participants in FY 2015, including a special section for former Intel workers displaced by a local plant closing. 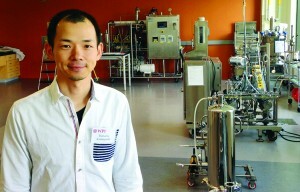 Most participants, however, are already employed in biomanufacturing. Specialized courses on troubleshooting and root-cause analysis of errors and process deviations drew the most (92) participants in FY 2015. In addition to New England, Participants came from California, Colorado, Illinois, Indiana, Minnesota, Missouri, New Jersey, New York, Ohio, and Pennsylvania. But no one traveled farther to attend the program than Wataru Kobayahsi (above), an associate quality manager at Astellas Pharma Inc. in Shizuoka, Japan. 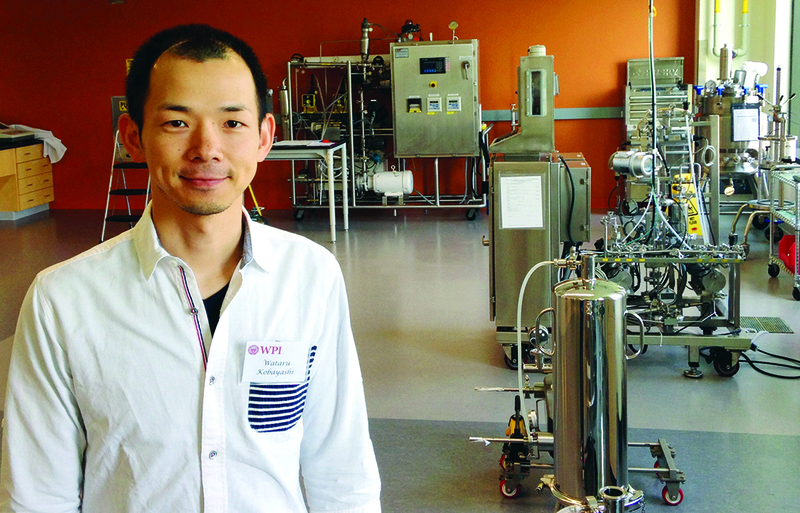 After learning of BETC’s capabilities at the 2014 BioProcess International Conference, Kobayashi’s supervisor asked him to attend. Astellas is an established drug company now developing its first biologic product (a monoclonal antibody), and Kobayashi will help manage its quality assurance program. He completed week-long programs in upstream and downstream processing earlier this year. Also in 2015, WPI became the first academic institution to join the Bio-Process Systems Alliance, an international association focused on single-use technologies for biopharmaceuticals and vaccines. BETC plans to help that industry group develop curriculum frameworks for educational and training programs for such technologies, which are transforming the biomanufacturing industry. To highlight the center’s success and the importance of biomanufacturing to the state’s economy, Massachusetts Governor Charlie Baker and Lt. Governor Karyn Polito held an event at the center on their first official day in office in 2015. A brief video of their visit is online at https://youtu.be/B4_MV-DQwwY. For the coming fiscal and academic years, Rashid said the BETC team will continue to work closely with industry to expand and evolve its capabilities and curriculum. New expression systems and process technologies are coming, as is an inaugural “Advanced Industrial Biomanufacturing” symposium in spring 2016.